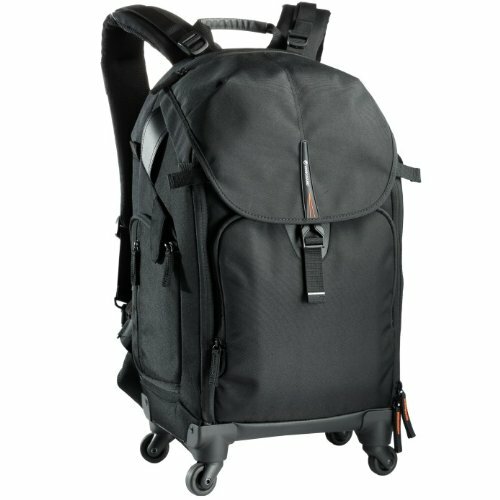 The HERALDER 51T is an amazing rolling backpack, with ‘four wheel drive’ we achieve ultimate roll along transportation as well as insure that the wheels do not dig into your back when carrying as a backpack. Not carrying your camera gear? No need for another cumbersome suitcase, simply remove the interior divider compartment and this bag doubles as everyday luggage. Upholding our high standards of quality, materials, and protection, The HERALDER 51T is designed to safeguard a large professional gear kit, which consists of a Pro DSLR with telephoto lens attached, 4-6 lenses, 2 flash units, and a multitude of accessories. Other essentials are also addressed and protected in a 14” wide screen laptop compartment, a dedicated tablet pocket up front, and accessory pockets. The ultimate working tool while on the go, the HERALDER 51T features: full flap opening for quick and immediate access to all your gear, adjustable dividers for ultimate set-up freedom, optimal balance tripod carrying system, total coverage rain cover, ergonomic air system back and harness, clutter free stowable shoulder straps, and bonus cell phone holder & accessory pouch. Always on the go, traveling, working in the field? The HERALDER 51T is the carrying solution you have always wished for!